Pub Table and Barstools are designed and made in USA. Commercial Quality – built to last! Our Classic Pub Table Chrome Barstool Package combines a 30″ round pub table and two retro barstools to create a classic package. The 30″ Round Pub Table Top has 2¼” real metal banding, premium bar height chrome column and case. Available in your choice of standard and premium boomerang or cracked ice laminates. Two (2) retro barstools featuring upholstered sewn hood swivel seat with contrasting “V” insert back, arched legs. chrome finish and optional footring in a Classic Package. These stools are available in your choice of standard or designer vinyls. Lifetime Structural Warranty Against Manufacturer Defects on Metal Chairs & Barstools; Two (2) Year Manufacturer Warranty on Tables. 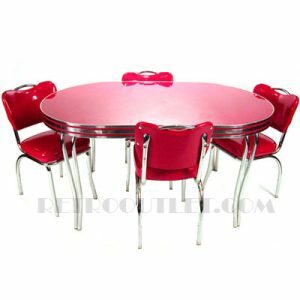 Please allow 5-6 weeks for production of all diner furniture manufactured per your specifications.